Posted on 7, January 2016 by EuropaWire PR Editors | This entry was posted in Automotive, Germany, Industrial, Technology, Transportation & Logistics and tagged automated driving a reality, increase vehicle efficiency and safety, NAIAS 2016, ZF. Bookmark the permalink. Friedrichshafen/Detroit, 7-1-2016 — /EuropaWire/ — As its first appearance in the U.S. at the North American International Auto Show (NAIAS) since the acquisition of TRW, ZF is demonstrating the potential of technology integration by unveiling systems that will increase vehicle efficiency and safety and make automated driving a reality. Using the slogan “Shaping the next decade of automated driving,” the third largest automotive supplier in the world will showcase its unique market position as it paves the way toward autonomous driving. 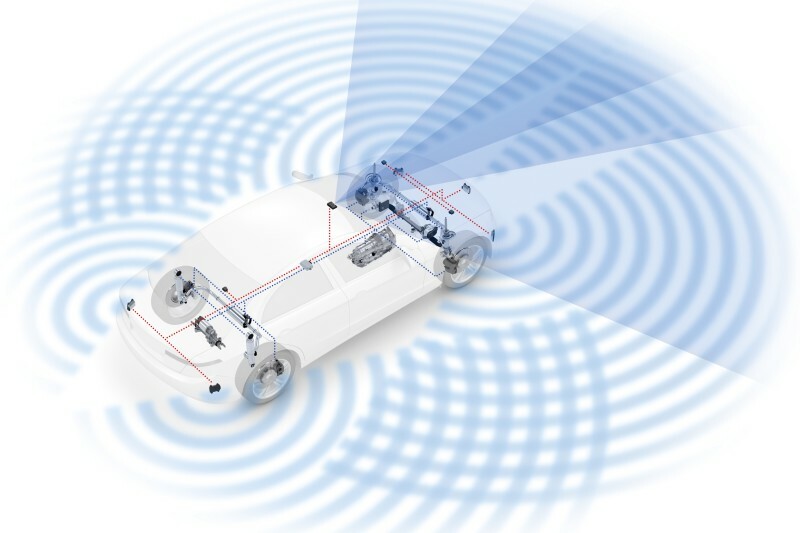 ZF supplies sensor systems, intelligent control units, and mechatronic actuators. The company intends to further strengthen its expertise in this area and offer technology to enable automated driving functions for all vehicle segments. In addition, ZF is driving electrification forward: starting with electro-mechanical actuators and individual hybrid modules via plug-in hybrid systems up to purely electric drives, including control units and power electronics. “By way of intelligent mechanics, we are actively pushing development in the direction of autonomous driving,” adds Dr. Sommer, CEO of ZF Friedrichshafen AG. “Achieving the greatest possible safety in any driving situation will become increasingly important and this will demand a new level of quality. Only if drivers feel completely safe, will they relinquish control of their vehicles in defined situations.” The requirements for driver assist systems, control units and actuators in terms of performance and environmental recognition, will accelerate considerably in the years ahead. Safety systems are also critical in protecting pedestrians crossing the street, cyclists in city traffic and other vulnerable road users. For this reason, the National Highway Traffic Safety Administration (NHTSA), as well as important crash test programs, such as the Insurance Institute for Highway Safety (IIHS) and the European New Car Assessment Program (NCAP), have also increased automatic emergency braking (AEB) requirements for passenger cars. These are set to become more stringent in the next two to three years, and therefore shorter stopping distances and faster response times are paramount. With active safety functions such as automatic emergency braking (AEB), ZF offers solutions that meet these safety requirements. The basic functions for these include advanced environmental recognition, robust and redundant mechatronic actuators, as well as sophisticated electronic control units. For example, radar and camera systems provide important information on the vehicle’s surroundings, while the central safety domain electronic control unit (SDE) processes the sensor data and sends relevant information to the steering, brakes, drivelone and chassis systems. ZF is gradually developing these functions into partially automated and, ultimately, fully automated driving functions. Electrifying the driveline is an essential means for ZF to further increase efficiency and significantly reduce emissions. The technology company already delivers all components for the electrified driveline, including control units and power electronics. The 8-speed plug-in hybrid transmission already available in volume production as well as a new, highly modular axle system with integrated electric axle drive will be highlights at the NAIAS. ZF has been active in the North American market for almost 40 years. The technology company currently has 50 locations in this region – 34 of which are in the U.S., 12 in Mexico, and four in Canada – and manufactures products for the automotive industry and other sectors. The number of ZF employees in the region of North America was 30,800 at the end of 2015; and roughly 12,600 of them work for ZF in the U.S. In 2014, the company generated total sales of € 3.7 billion, with almost one-fifth of that sales (€ 18.4 billion) coming from North America (ZF Friedrichshafen AG 2014 consolidated group sales without the ZF TRW Division). After the acquisition of TRW Automotive, the sales shares from North America will be even higher in 2015. Powerful sensors, complex electronic control units, and mechatronic systems from ZF enable cars to see, think, and act autonomously.